On our safaris visiting the Seychelles, enjoy ‘castaway’ seclusion on an island mélange of white-sand beaches, turquoise water and velvet nights under tropical skies. 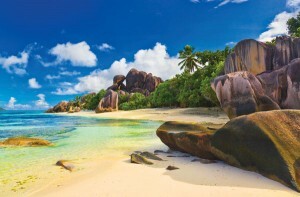 Postcard beaches, old-growth forests, coral reefs and UNESCO World Heritage Sites are some of the attractions of the Seychelles archipelago’s 115 coral and granite islands. On our safaris visiting the Seychelles, you can hike mountain trails, revel on white sand beaches soaking up the tropical sun, dine on fine Créole cuisine and photograph unique flora and fauna. The archipelago channels boast some of the richest fishing grounds in the world and its reefs offer world-class diving and snorkeling. The larger, inner islands of Mahé, Praslin and La Digue are the most developed. Mahé is home to the capital, Victoria. Explore the UNESCO-listed Vallée de Mai, Praslin’s ‘Garden of Eden’. La Digue shelters the world’s most breathtaking beaches and visit the UNESCO-listed Aldabra, the world’s largest coral atoll.